Have you ever had something come along and ruin your planned dinner? Maybe the meat you planned to cook had spoiled, or you were missing a crucial ingredient for your planned dinner? Or maybe you struggle to shuffle the kids around from afterschool activities and back home in time to cook dinner every night? We’ve all been there and busy families have probably been there a lot. This is where instant pot recipes come in handy. The Instant Pot is becoming one of the most popular kitchen appliances out there. It can be used as a slow cooker, rice cooker, pressure cooker, and so much more! It makes it so much easier to prepare delicious meals for the whole family, no matter how busy you are. You just put it in the pot and get on with your day. Really, it’s that simple and there are so many wonderful things you can make with it. One of my favorite Instant Pot Recipes? Instant Pot Beef Stew. Don’t think that Instant Pot recipes have to be boring, or that it means you’re eating the same things every day. This couldn’t be further from the truth. 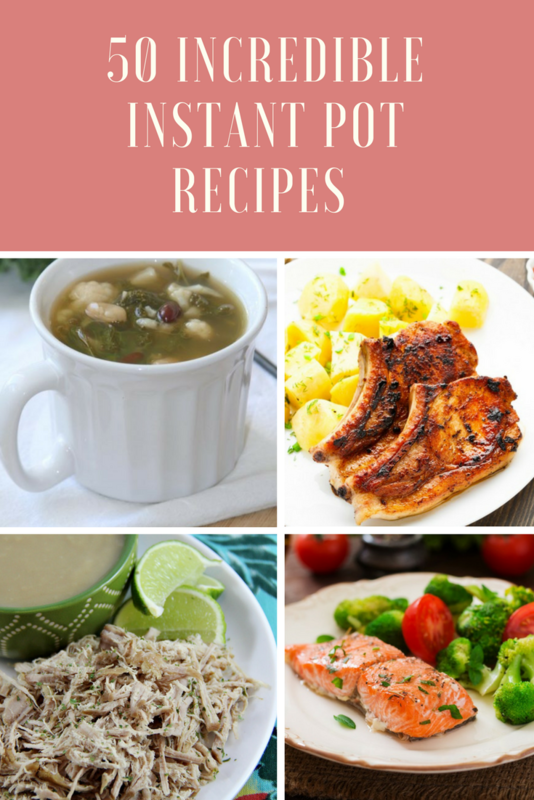 There are tons of different things you can make and savvy Instant Pot users are coming up with more creative recipes every day. If you haven’t already invested in an Instant Pot, the time to do so is now. If you already have one, you’re going to want to save these recipes now so you can try them all for yourself. Get things to make your life easier while using your Instant Pot. Instant Pot Mini Mitts Instant Pot 9″ Glass Lid with Lid Holder Attachment. Here are many more Instant Pot cook books. There are many that are FREE! The amount of recipes you can make in this handy device are endless! Here are 50 incredible instant pot recipes you need to try!